Conor McGregor may have lost the battle at UFC 229 but he's not giving up on the war just like his head coach says he won't suddenly stop trash talking Khabib Nurmagomedov if they meet again. Conor McGregor is nothing if not consistent. The former two-division champion suffered his second loss inside the Octagon last Saturday night when he was submitted by Khabib Nurmagomedov in the main event at UFC 229. Afterwards, Nurmagomedov ended up in a brawl outside the cage with McGregor’s teammates and then justified his actions by pointing to all the insulting things the Irishman said about him, his family and his country in the lead up to their fight. Some have said McGregor was out of bounds while most agree that he was promoting a fight and it wasn’t all that different from any of his other contests. What is certain is that McGregor isn’t going to suddenly tone down his pre-fight rhetoric and decide to refrain from trash talking Nurmagomedov should they get put together in a rematch in the near future. 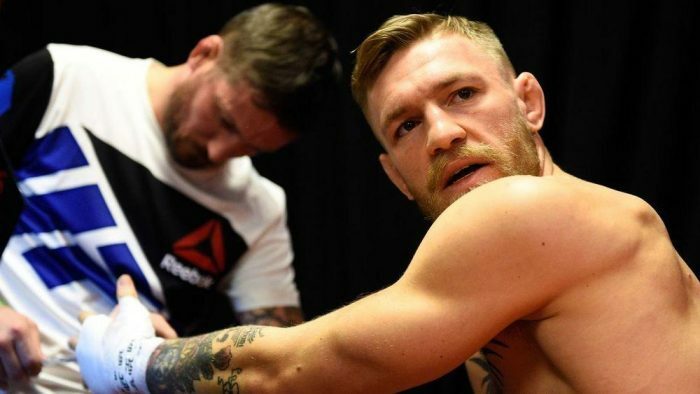 “He’s never going to not be him,” McGregor’s head coach John Kavanagh said on the Joe Rogan podcast. “That’s the side of his personality. It’s a dividing line. My parents aren’t mad about it but the kids at my gym love it. It’s just one of those things. While there might be a feeling that McGregor would be less apt to use his trash talk against Nurmagomedov considering he just got submitted, Kavanagh says you only have to look as far as the Irishman’s other loss in the UFC to see how he’s going to react. Nurmagomedov may have defeated him in the cage but McGregor is never going to be deterred from attacking an opponent before a fight and a rematch between those two would be no different.